Paphos is a major city on the southwestern coast of Cyprus. Renowned and celebrated for its extraordinary ancient remains, making it a popular tourist destination, but that sense of antiquity has been aligned by the luxury and quality offerings at the spectacular five-star Aphrodite Hills Hotel, situated in the beautiful hills above the town, providing an experience like no other, which notably featured in Forbes magazine’s ‘top five resorts’ ranking and being named the world’s most desirable new resort. Aphrodite Hills Resort is just 15 minutes away from Paphos International Airport and 55 minutes from Larnaca International Airport, making it easily accessible for guests. Possessing a consistent daytime temperature of around 30 degrees centigrade during the key travel months – March/April/May and September/October/November – the Mediterranean Climate is a huge draw to Paphos. Paphos Archaeological Park is a UNESCO World Heritage site that features the ancient Greek and Roman city, showcasing remarkably vivid ruins of this long-gone civilisation. Extraordinary architecture and landmarks are found throughout the town, which is also renowned for its cultural and artistic festivals, not to mention spectacularly rocky coastal views and beaches. 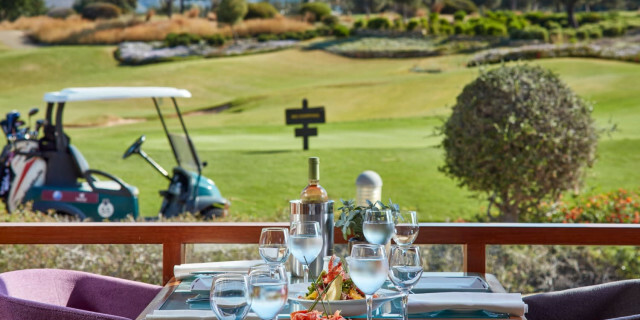 The Aphrodite Hills Golf Resort features a stunning 18-hole PGA National Championship Golf Course, supported by a Golf Academy and striking Clubhouse (boasting superb bar and restaurant options) that welcomes all standards of golfer. 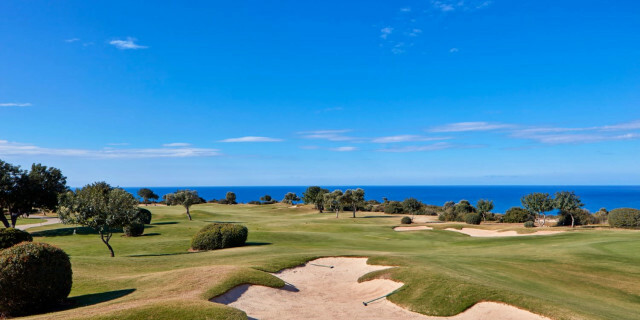 It’s a majestic layout framed by breathtaking surrounds, opened for play in 2002 following the design of Cabell Robinson, who engineered the holes through olive and carob trees, with the course positioned on two levels, split by a ravine that boasts incredible views across the Mediterranean Sea. However, the setting has been enhanced further by recently unveiled course alterations. An unprecedented €2.5m investment has upgraded the facilities, including a reconstruction of the greens and bunkers, with the fresh layout opened in January 2018. Further investment has been injected to redevelop the Clubhouse, to be in position for April 2018, ensuring that the experience delivered by Aphrodite Hills matches the fable of the Goddess of Love, whose name it adopted. Golfers will also relish enjoying nearby Elea and Secret Valley, two spectacular courses that complement the PGA National and deliver a complete golf menu for those venturing here. 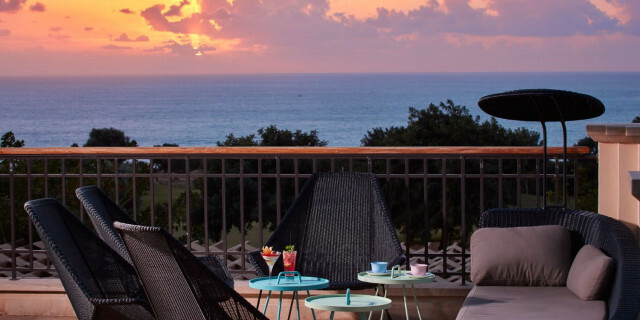 Aphrodite Hills is a luxury resort that has a selection of 290 rooms and suites to choose from. 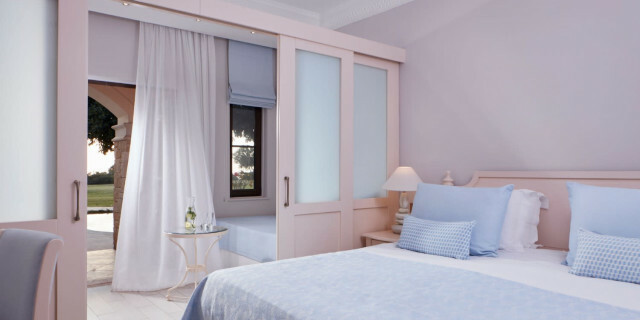 Luxurious accommodation with views across the Mediterranean and Paphos countryside. These are sizeable hotel rooms that provide Internet Access, Satellite TVs, Air Conditioning, Walk-in Showers, and Private Terraces. Guests may select rooms with a Sea View, Pool View or Garden View. Luxury Suites have the bonus of Private Pools or an Outdoor Jacuzzi for those who wish to sample the ultimate in relaxation. Holiday Villas and Apartments have been suitably designed for guests looking for greater freedom or space, perhaps as a group or family. These are available in a range of 2 to 5 bedrooms, and boast lounge and dining areas, with several of the Villas having private swimming pools, completing what would be a memorable and thoroughly satisfying experience. 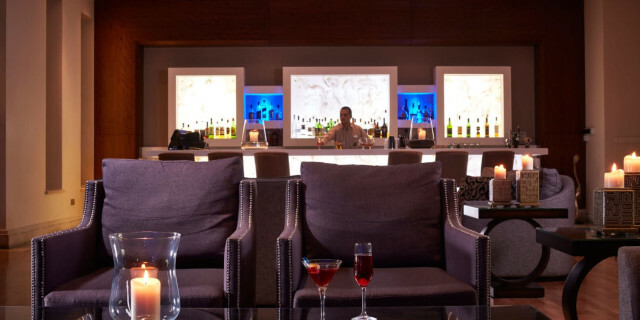 Aphrodite Hills Resort offers an impressive array of restaurants and bars throughout the Resort, the Golf Clubhouse, and the bustling Village Square that operates as the venue’s social hub. These are distinct and provide a variety of dining options reflective of the mood and occasion, including The Aphrodite Hills Golf Club Restaurant, Anoi Pub, Pithari Tavern, Zimi Trattoria, Ladi and Rigani, the aptly named Beer Garden, and the Gate to India that rests in the heart of the Village Square. Looking closer at the Village Square, which promotes a sense of community within the Resort. Featuring a wide range of shops, the aforementioned restaurants, a wedding chapel, and open spaces that offer guests the chance to soak in the surroundings and savour the relaxed atmosphere. It has been created from locally quarried stone, and rests at the centre of the Resort gazing across the Mediterranean and reflects the unique feel of a Cypriot village. For those seeking treatment and relaxation, The Retreat Spa at Aphrodite Hills was awarded the highest accolade in the industry by winning “The Best Spa in Europe” award at the 2008 Professional Beauty Awards. Half a decade later, the Spa Traveller Readers Award 2013 declared The Retreat Spa at Aphrodite Hills as being the most prestigious “Best Spa & Golf Resort in Europe”. High praise, indeed. Elsewhere, there is an extensive collection of activities to enjoy in addition to the facilities and terrific golf courses. The Aphrodite Hills Riding Club offers horse riding opportunities and lessons within the forestry land of Lakkos Tou Frangou for potential riders of all standards and experience, which could be a fun time for a family group. Cycling is a popular activity at the Resort, with routes contrasting between the comfortable roads, and the more challenging tracks in the hills that frame the Resort. Additionally, guided cycle tours are available to the village of Kouklia, and the Port of Paphos or Limassol, which is a superb (and healthy) method of discovering the wider area outside the main Resort. Walkers and runners will also find much to satisfy them, as those surrounding hills feature some wonderful routes for a stroll or jogging, including marked paths that possess striking views, presenting an unparalleled panorama of the Mediterranean and the Aphrodite Hills Golf Course. However, if you’re looking for something to do in the evenings, the Resort offers its guests a range of entertainments, including live music, shows, theme and outdoor movie nights. During the summer months, there is a series of events held within the Village Square, where the likes of live dance performers, musicians and quiz nights have proven to be hugely popular. Finally, the Zias Beach Club is located in nearby Avdimou Bay, following a beautiful drive from the Resort, and offers two options – complementary beach privileges including sun beds, umbrellas and beach towels, AND the bar and restaurant that sits on the beach, making for a wonderfully tranquil and delightful setting to soothe away the time in the sunshine. 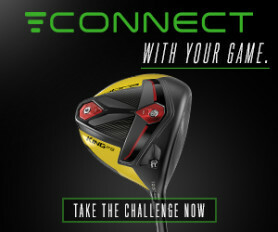 For more information ob Aphrodite Hills and how to book, visit Golfbreaks.com.